Before the concept of printing money to purchase bonds was created, people believed the debt a person, corporation or government acquired would have to be paid back with the borrower's future income stream. If an entity became unable to service the debts based on their income they could look for creative ways to push back a default, such as borrowing money from other sources to pay interest on the original debt. Eventually the ability to borrow more money to pay interest ends because creditors realize they are providing capital that will never be returned. This point is often referred to as "The Minsky Moment" in a debt cycle. We reached this point globally when the cracks began to appear in the global debt markets in the summer of 2007, it accelerated when the doors closed on two major Bear Stearns hedge funds in February 2008, and it reached a crescendo when the global debt markets completely froze following Lehman's bankruptcy in September 2008. The same process has been occurring since the debt markets last collapsed in late 2008; individuals, corporations and governments are widely taking on more debt than they will ever be able to repay. Throughout this process confidence has risen and asset markets have been "bid up" as investors chase prices higher confidently believing this time will end differently. Here is a snapshot of this process occurring in the United States. 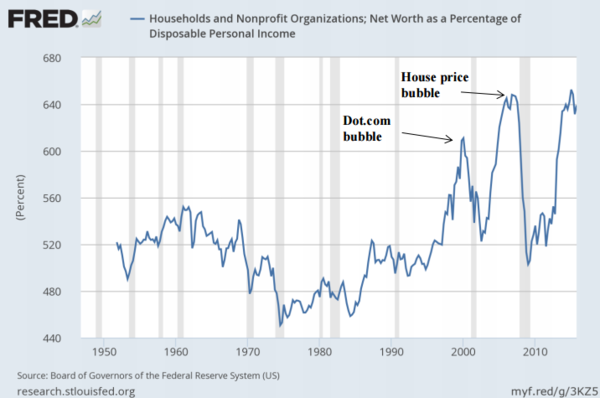 The following chart shows household and nonprofit organizations net worth as a percentage of disposable income. In other words, how assets are priced relative to the actual underlying income available to support them. Will the story end differently this time? The short answer is no; it will ultimately end in disaster. In regards to how and when the story ends the answer becomes less clear. Why? We have entered a new age in global finance; Pre-Emptive Central Bank Invervention. In this new world central banks not only stand ready to protect the markets after a collapse, they are now pre-emtively entering markets to try and hold asset prices at artificially high levels. Their main responsibility is to keep asset bubbles from bursting. We recently discussed why I believe Japan will be the opening act for the next major dislocation in the global debt markets (see The Coming Global Bond Market Disaster: Japan Prepares For The Opening Act). Very simple math shows you Japan's bond and currency markets represent an inevitable train wreck, but is there a way they can avert or push back their coming crisis? The Bank of Japan is currently on pace to accumulate the lion's share of the outstanding government debt in Japan. What if, when they finished their accumulation process they announced they would "forgive" that debt? Essentially they would tell the government, "you no longer owe us the money." Another option would be to change the terms on the debt owed. Hypothetically, they could extend the duration out to 100 years and make the new interest rate 0.0%. That would effectively erase the debt even though it was still listed on the central bank's balance sheet as an asset. What would be the outcome of this action? As I just said, no one has any idea, but walking through the thought process to try and determine potential outcomes is important. My guess is the consequences of this action would be a sharp reduction in the value of the Japanese currency in the foreign exchange markets. Japanese leaders have likely already discussed this potential endgame. What could stop this from working? The decline in the value of the yen becomes so severe that it creates an unbearable level of inflation for Japanese citizens. Investors purchasing bonds in a highly inflationary environment would charge higher interest rates to compensate for the loss in future purchasing power. At that point the central bank becomes trapped. They will have to make a decision; either continue forward with QE to buy bonds and protect interest rates or defend the currency by stopping their purchases (or even selling), which would allow interest rates to soar. If rates rise to about 2%, then the annual cost to service just the interest alone on the government debt would overwhelm 100% of the annual tax receipts. At that point, the Minsky Moment has arrived and bankruptcy/default follows soon after. This means the race is on, and we can only sit back and watch how it all unfolds. Can the central bank accumulate (and then forgive) enough debt before the currency receives too much punishment in the forex markets? My guess is the Bank of Japan will lose this race and you will witness the interest rate rising/inflation disaster I just described unfold for Japan on the world's financial stage. As the world watches in horror it will be the first major chink in the armor surrounding the collective belief in central banking omnipotence. Once investors understand central bankers have only delayed the real crisis building under the surface, the smart money will begin to rush to the exits and the rest will soon follow.